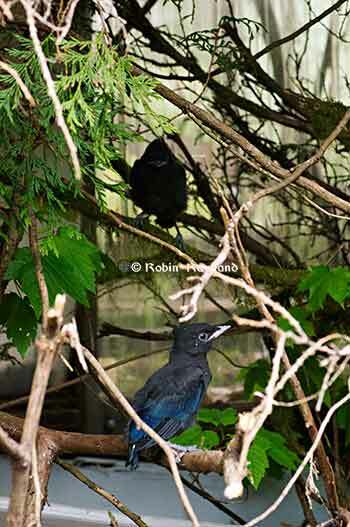 I am lucky enough to be surrounded by the magnificent steller’s jay. A group of them live in a tall conifer across a small park from my house. 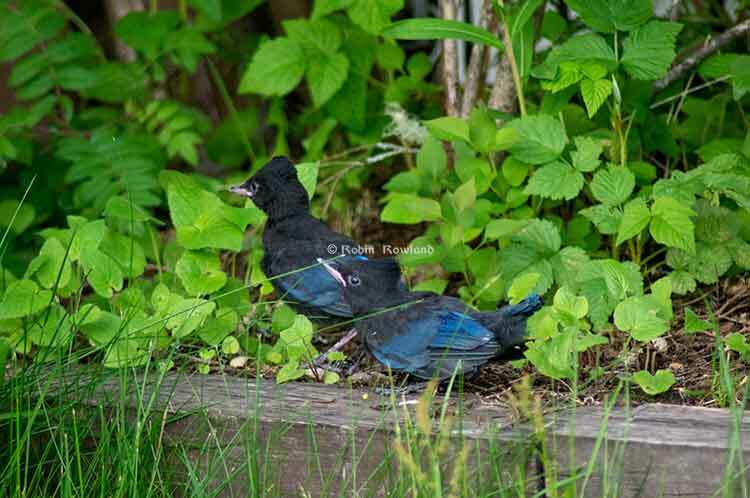 (Unfortunately BC Hydro contractors opened up one part of the tree while rewiring the neighbourhood so the steller’s jays in that tree may be vulnerable.) Others frequently visit (and may be living–I am not sure) in the cedar trees that mark the boundary with my neighbour’s house. 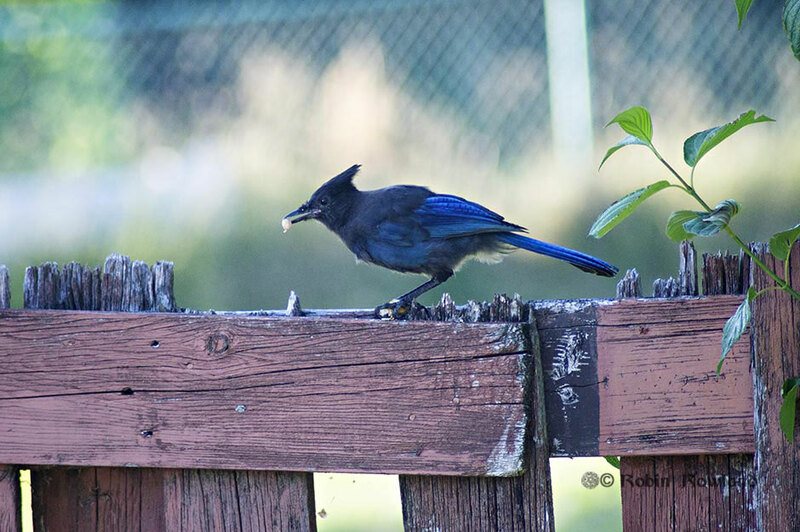 So the steller’s jays are frequent visitors to the feeder on my back deck. 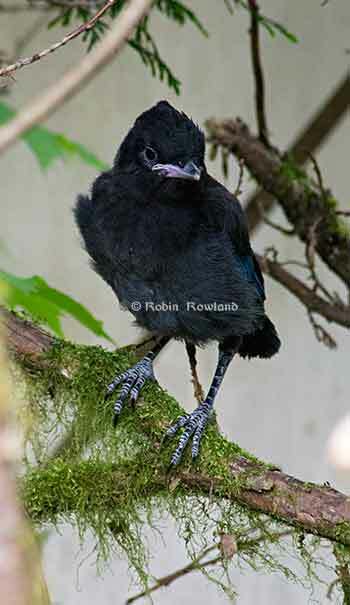 I’ve been photographing steller’s jays on my deck, in my backyard and in the bush around Kitimat for the past eight years. 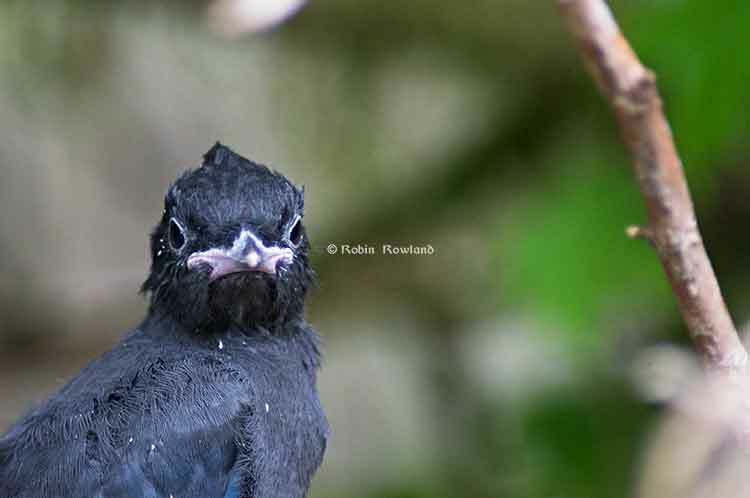 So I must have thousands of steller’s jays photos spring, summer, fall and winter for those eight years. Friday night was a beautiful summer evening. 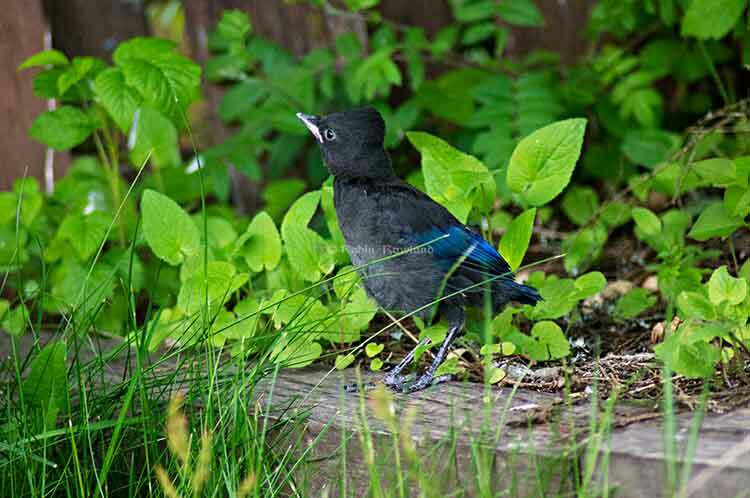 I spotted three steller’s jays in the grass of my backyard. 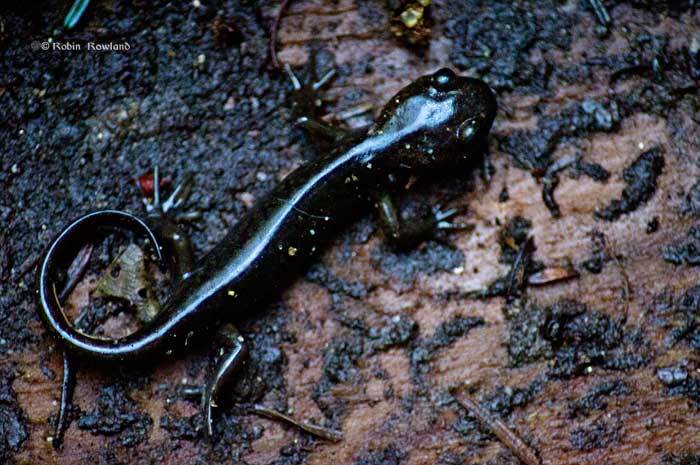 I grabbed a camera, stepped out and saw–and heard–something I hadn’t seen in eight years. 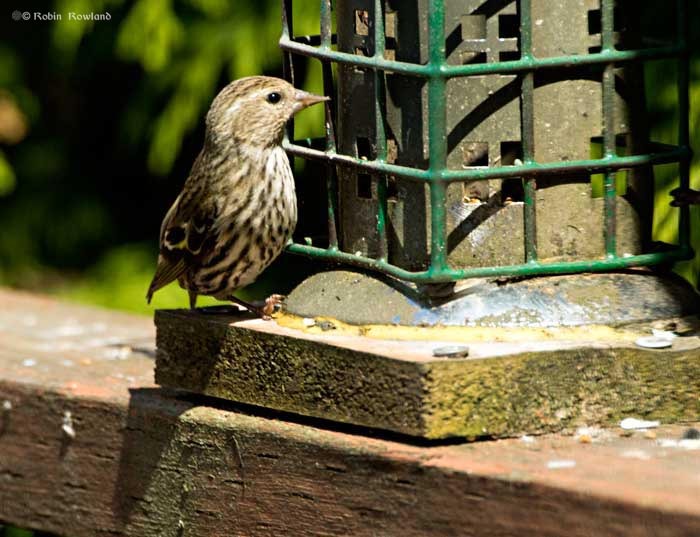 For my feeder I used a wildbird mixture that it is mostly sunflower seeds, maize and shelled peanuts. 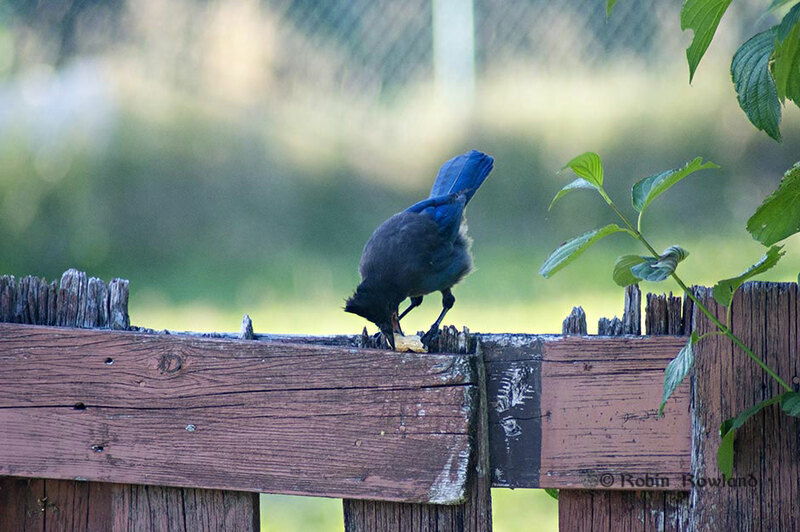 Although steller’s jays love peanuts I have never left out peanuts in the shell. But one of my neighbors does and I have seen from time to time a steller’s jay with a peanut in its mouth, usually on the ground before flying off into the trees. What I saw Friday night (again Monday night) was entirely different. 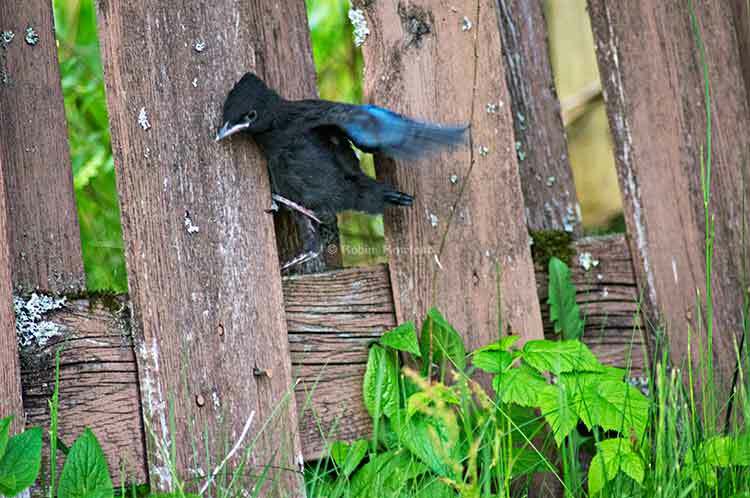 One steller’s jay had found a way to crack the nut case in my old rotten fence. Tonight there were two at it. 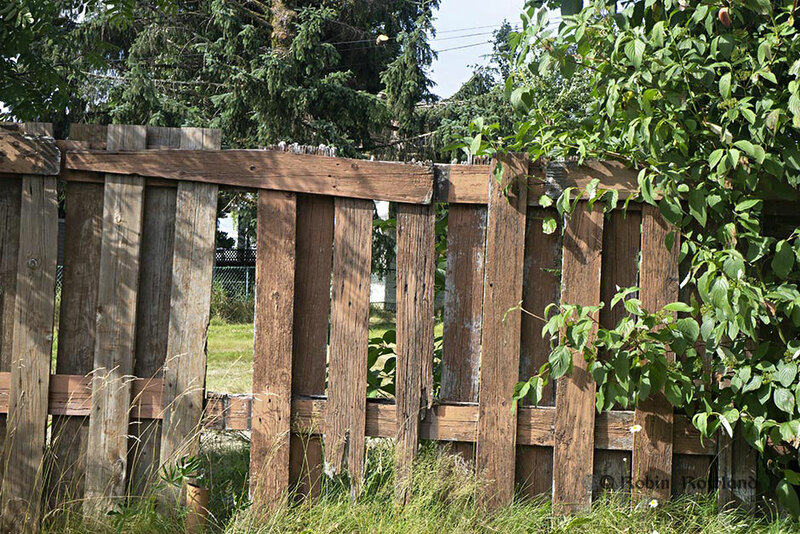 First about the fence, it’s old, probably original to the house when it was built in 1960, with parts rotting away and falling apart. I had planned to replace it this summer but then I had to pay for major car repairs. Before that it was a new roof and a new furnace. 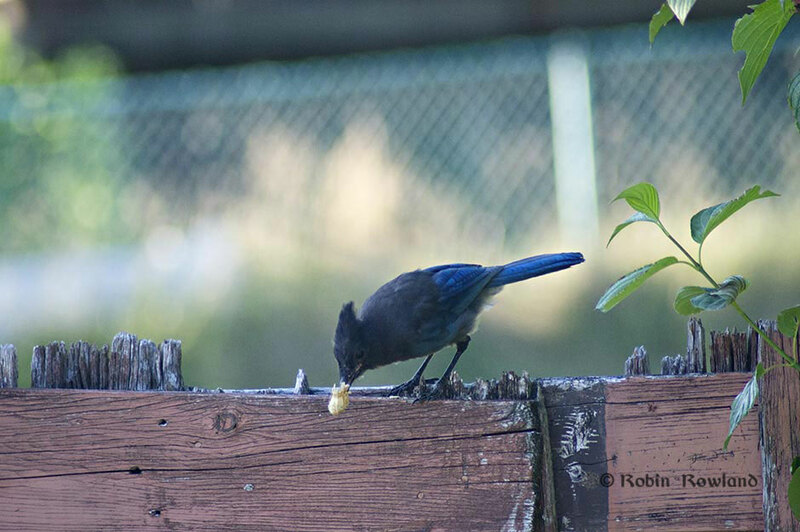 On Friday evening, that one steller’s jay found the perfect place to anchor a peanut in the shell. 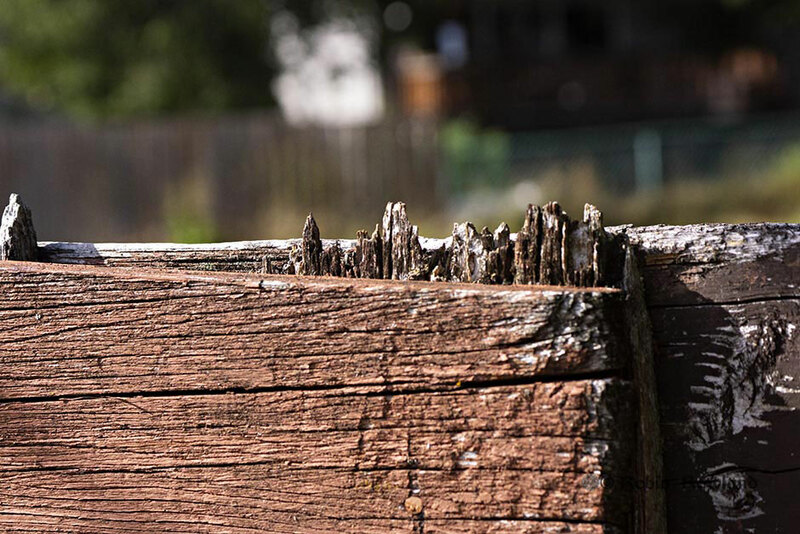 My rotten old fence. 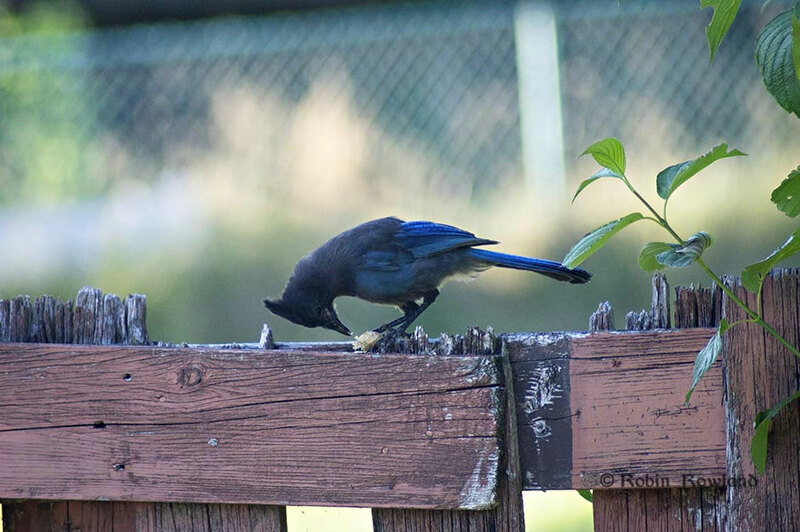 All three jays in these photos are of juveniles; note the fluffy grey chests and behind legs, and the yellow skin at the corner of the mouth. 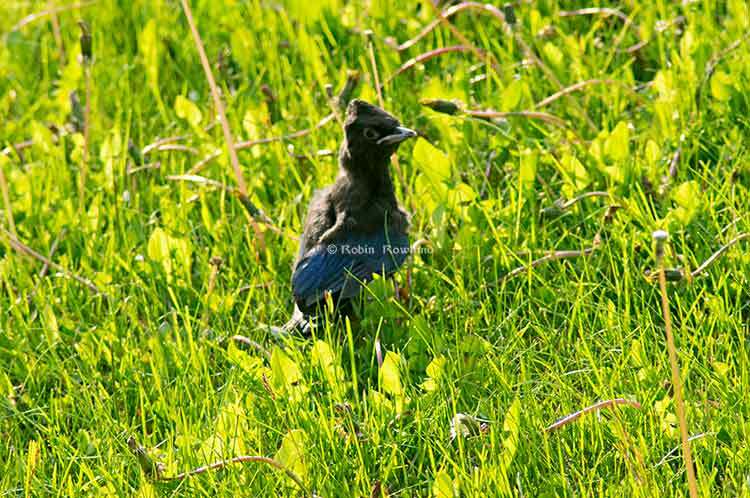 You may have noticed them giving odd raspy juvenile type calls too. 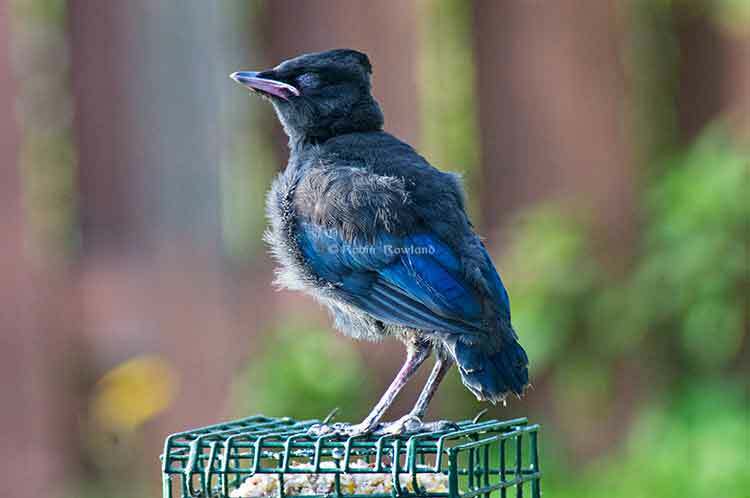 Sometimes the young jays at this age, which come to feeders with peanuts, ignore peanuts and sample the seeds instead. It seems they get ‘turned on’ to peanuts through ‘social learning’ – meaning they observer others and learn there’s food inside. Seems like the young jay in the photos was new to the task. 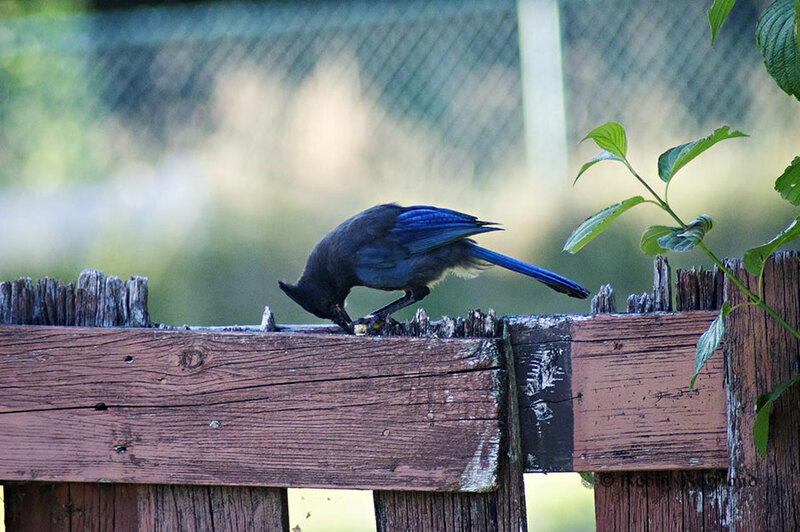 Experienced jays seem to extract the nuts from peanut shells quite quickly with deft strikes and prying movements (unlike the young bird in the photos). I agree, the youngster seems quite clever to have pushed the nut against a crack to hold it in place before aiming blows. As for the hammering sound. 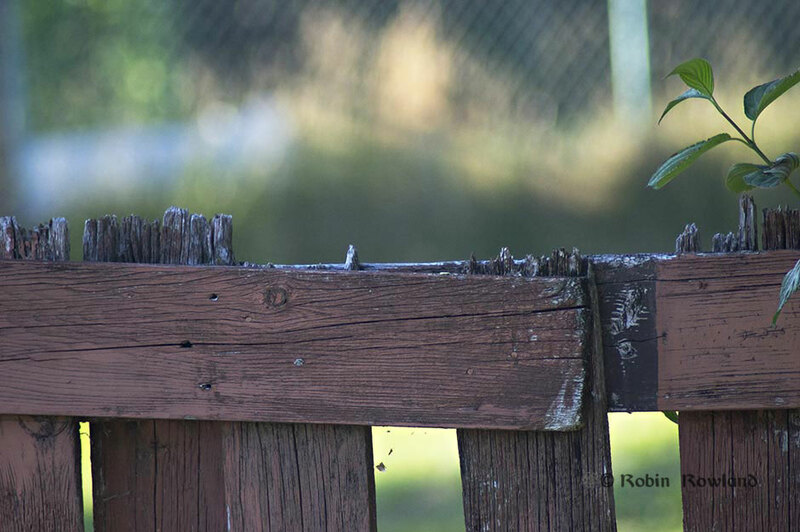 I suspect that was the beak coming into contact with the wooden fence. Incidentally, hammering on wood (knock, knock, knock) seems to be a behavior used in frustration or perhaps to signal a threat during aggressive encounter. So here is the complete sequence from 18:47:53 Friday, July 13, 2018 to 18:49:39. All images copyright Robin Rowland 2018. 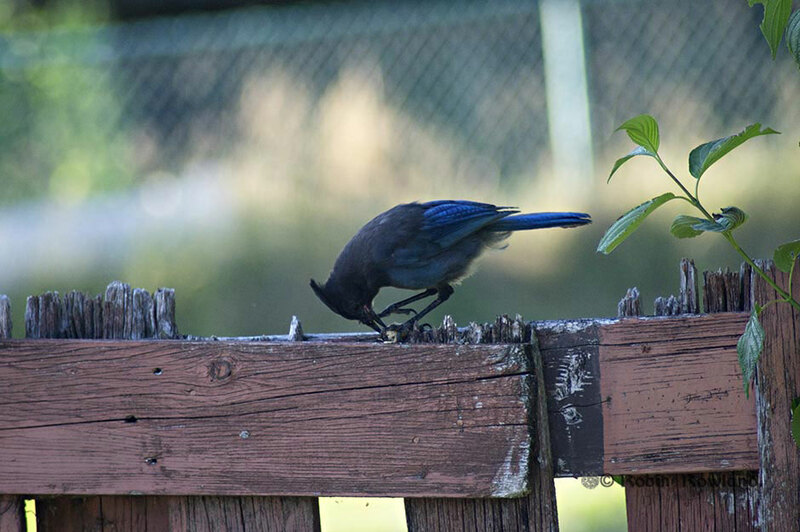 The steller’s jay is wrestling with the shelled peanut. 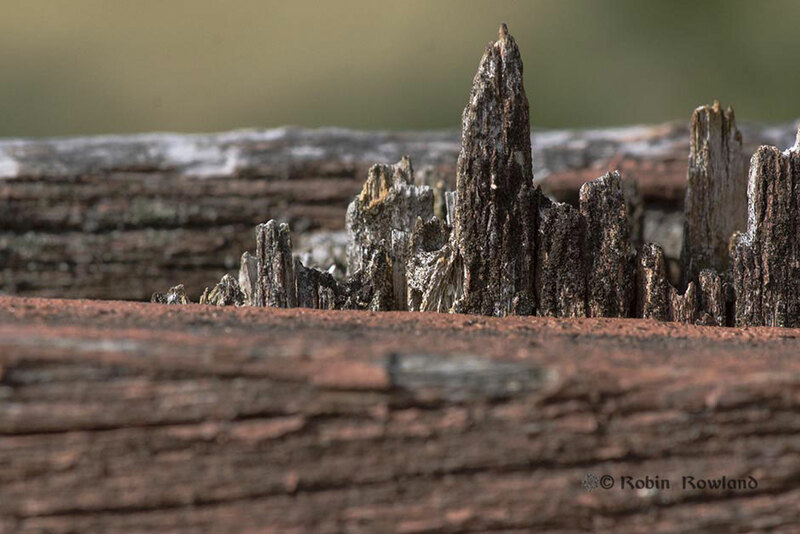 It seems to have done quite well demolishing the shell, in a gap against the old fence post. But apparently half the peanut shell was a hard nut to crack. 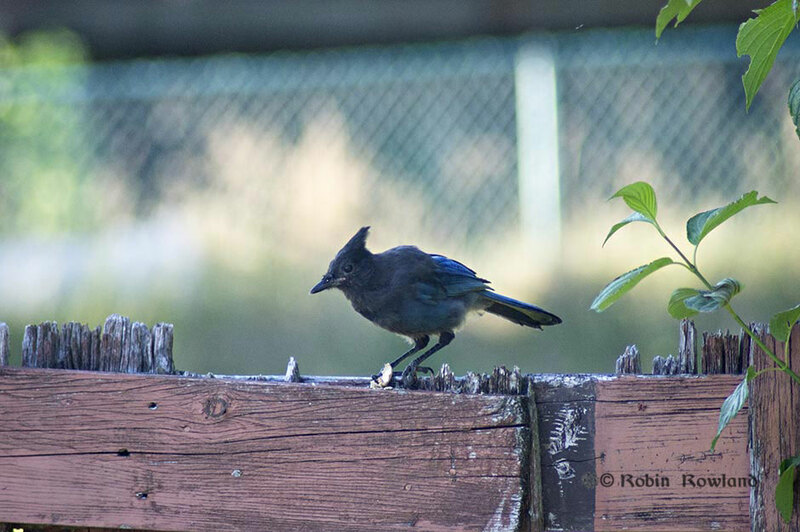 The steller’s jay takes a look…. 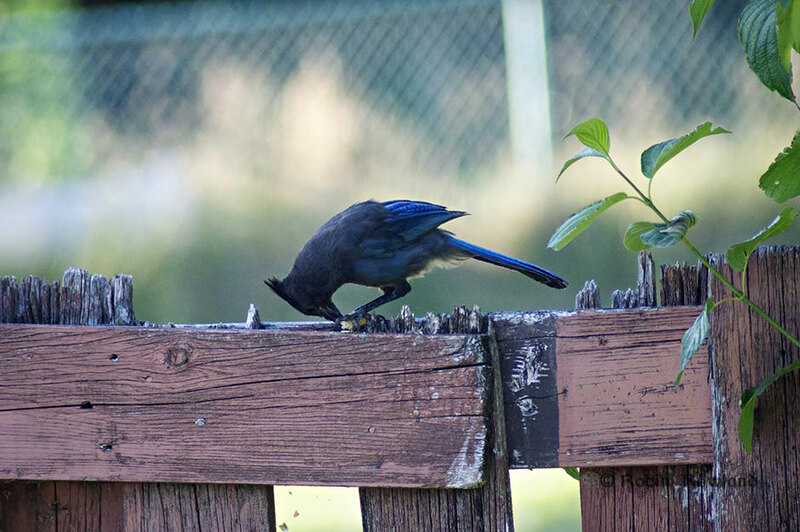 I turned away for just a few seconds, and took a shot of the jays on the grass, with corn in their beaks. 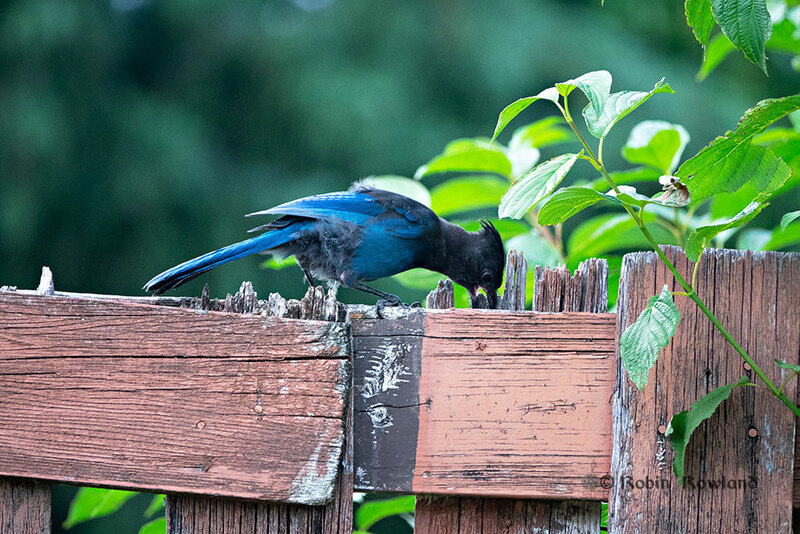 While shooting the jays on the grass I heard a “knock, knock, knock” sound, looked up and saw the steller’s jay working with its beak to crack that shell which was now anchored against the fence post. Smart! 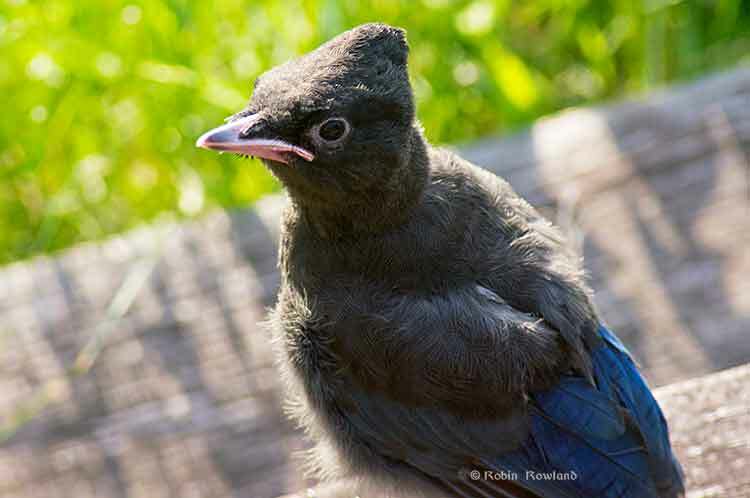 With the peanut shell firmly anchored against the wood and held tight in its feet, the steller’s jay repeatedly taps with its beak against the shell. It keeps trying. You can see part of the shell (or perhaps the peanut) on the beak. 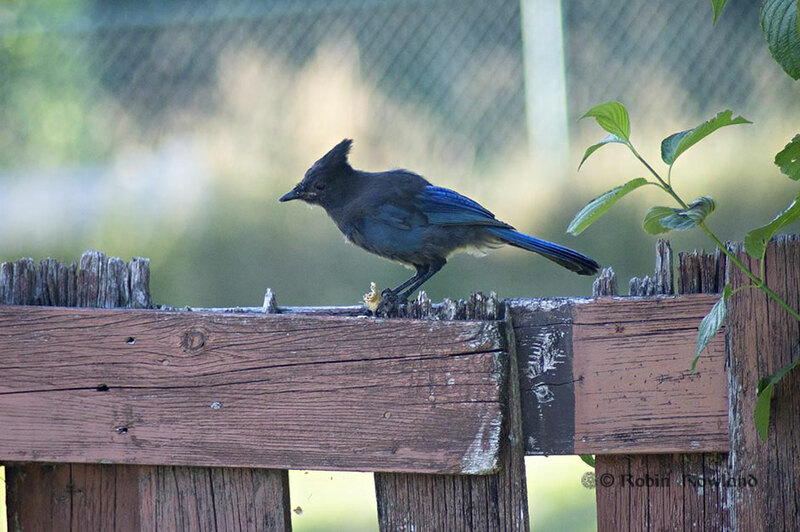 … as the steller’s jay pauses for a second or two. Finally success! It has the peanut out of the shell. 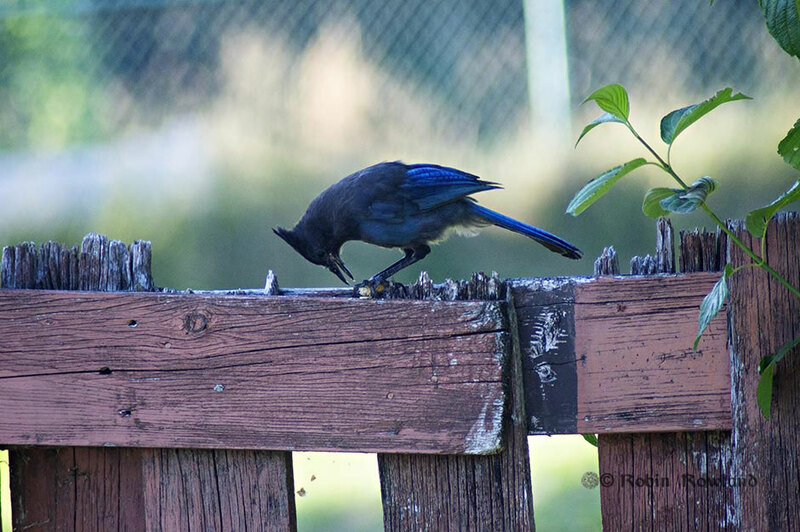 The steller’s jay discards the peanut shell. A long shot of my fence taken the next morning. 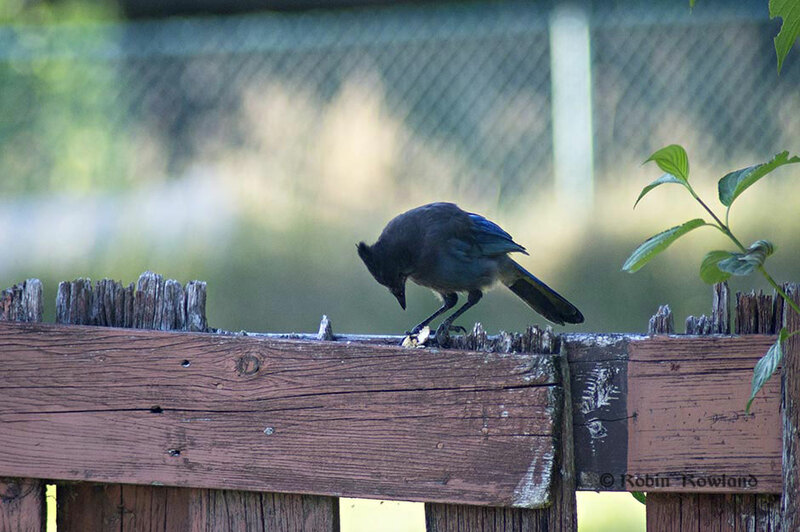 A closer view of the area that the steller’s jay used to crack the nut. And an even closer shot showing all the possibilities for an intelligent bird to anchor a peanut. 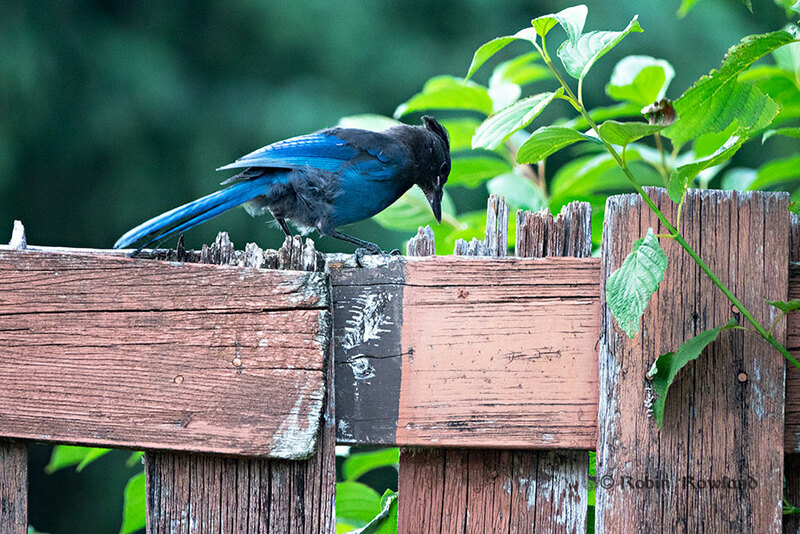 I just happened to look tonight (Monday July 16) and the steller’s jays were back at the rotten part of the fence. 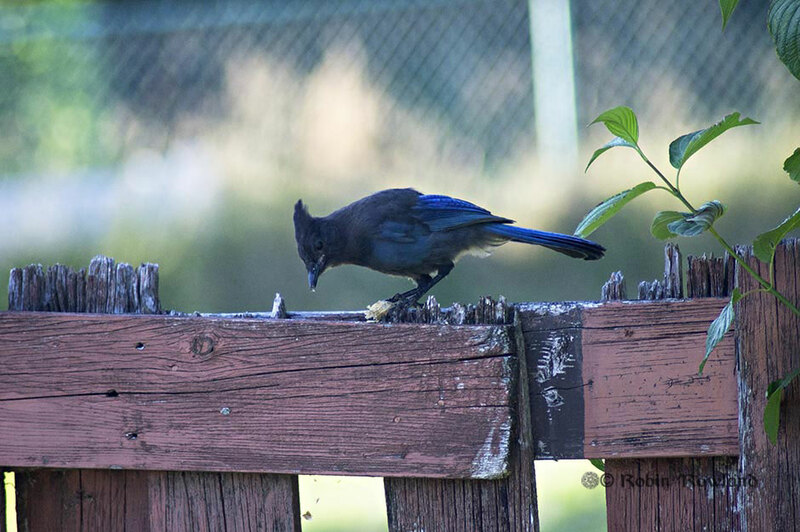 This steller’s jay was back close to the spot where the peanut was cracked on Friday night. 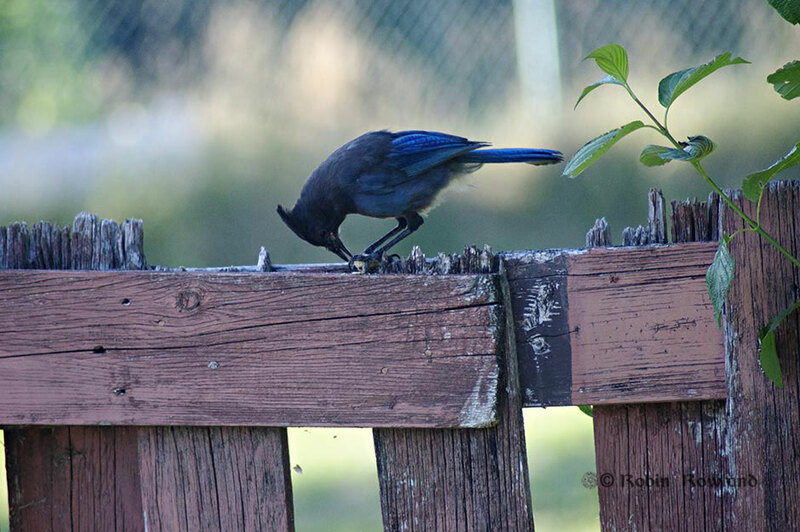 No sign of peanuts tonight, so it was probably looking for bugs. This is the tree where I’ve seen the steller’s jay living for the past eight years. 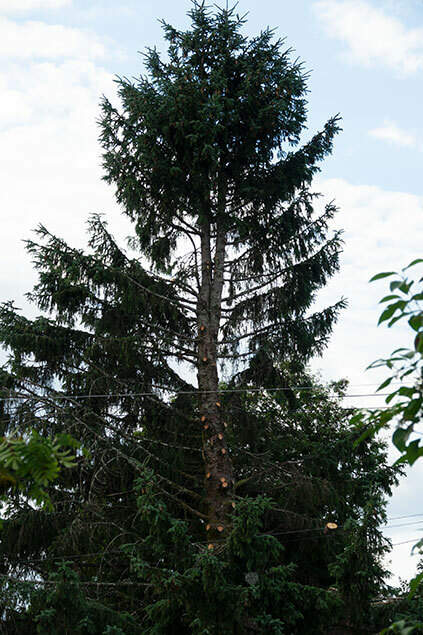 You can see how BC Hydro contractors cleared a whole section of the tree to install new power lines that you can also see in the image. When I got back late in the afternoon….. 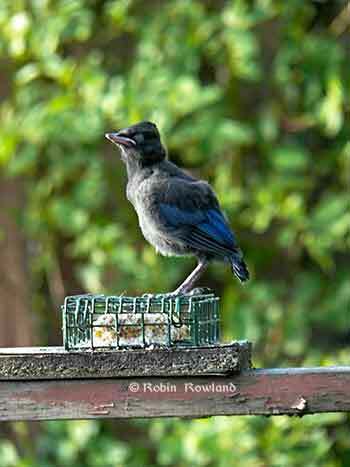 So when I returned, a stellar jay fledge was perched on the suet feeder. 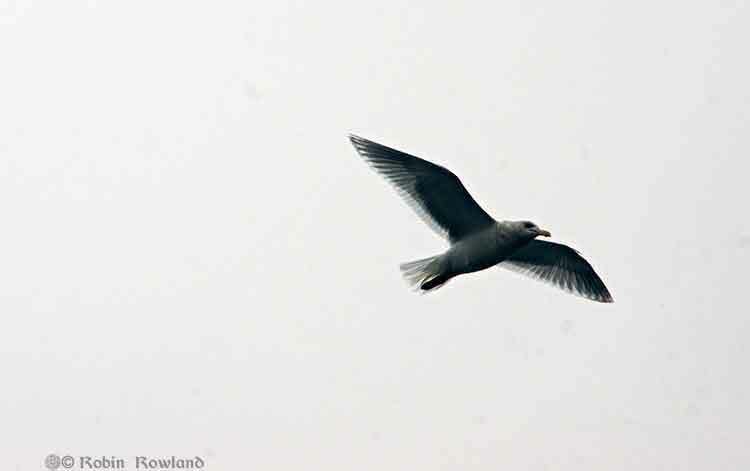 I stayed well back using my 300mm zoom lens. For almost 20 minutes, the bird never moved. 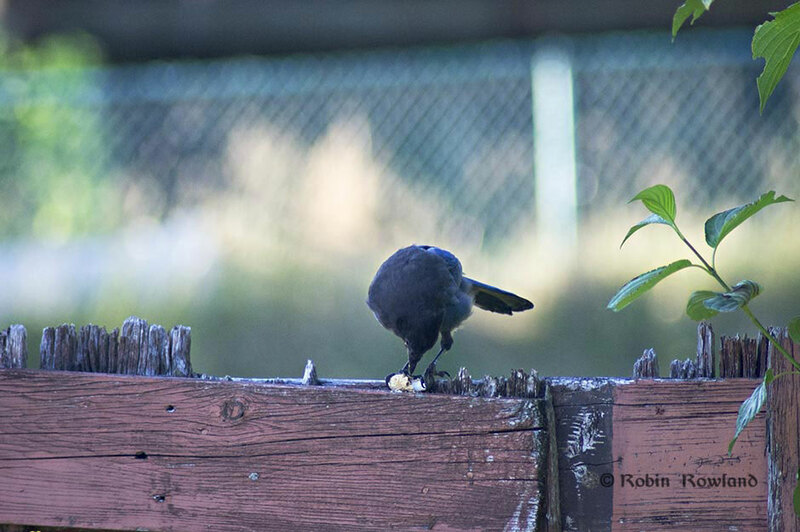 I was wondering it the bird was blind…. 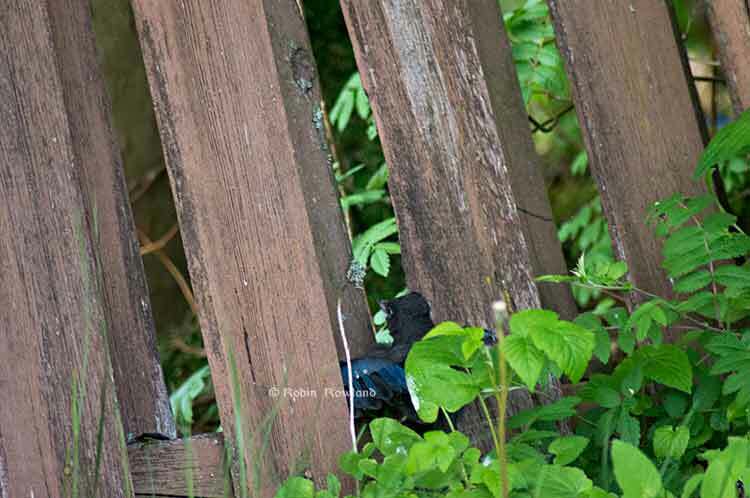 Then the fledge flew down to the deck and then hopped–not flying–down the steps. I came out on the deck, still keeping far away from the small bird. It looked at me, so clearly the fledge wasn’t blind, as it looked up. The fledge then hops into the grass of my backyard. It hops all across the yard to the back fence (not pictured) then suddenly flies over to the fence on the east side of my yard. 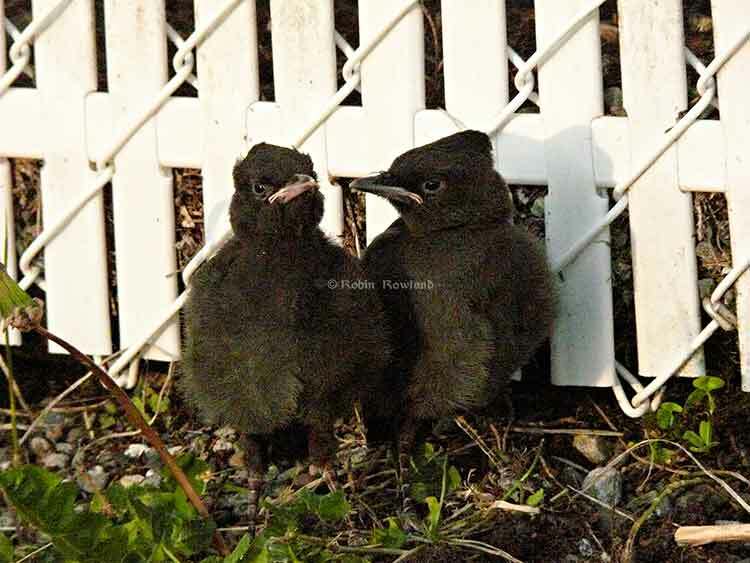 There was the fledge’s sibling huddled against the fence. The two seemed to greet each other. 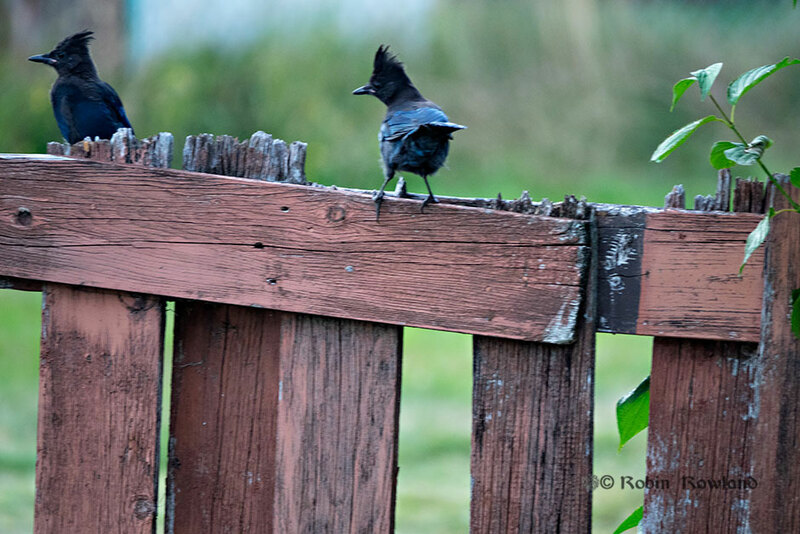 A while later, one of the fledges, walks toward the north fence of my hard. It looks up. The young fledge tries to fly, but doesn’t make it. 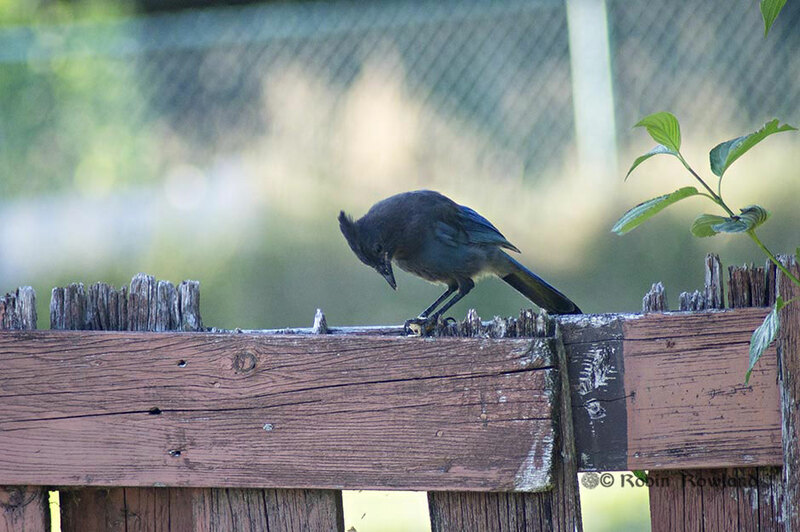 And grabs on to the fence with its feet. So the pair walk toward the fence. 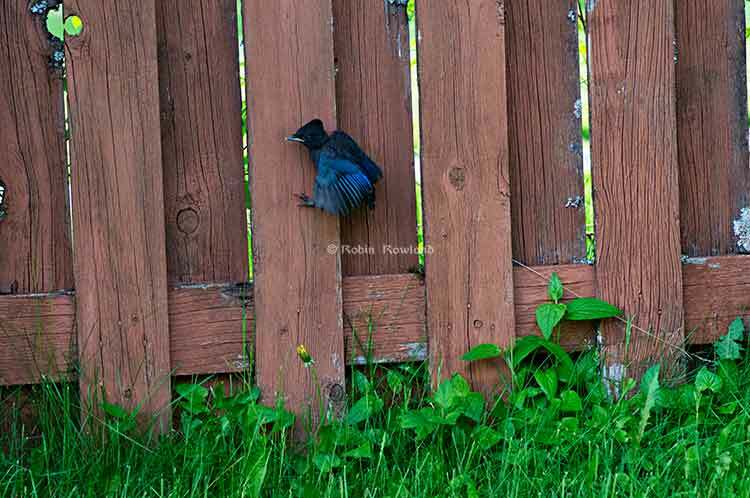 Again the fledge tries to fly over the fence. So the pair walk through the bottom of the fence and disappear from my yard. I was worried that the young birds, apparently still not able to fly that far, would fall victim to the cats that roam the park behind my house and sometimes come into my yard. Then two days later, on Tuesday, on my morning walk I came across what I am pretty sure is the same pair, about a kilometre from my house, in a gap in a cedar hedge. Here’s what I believe is the most adventurous of the pair looking out at me from the hedge. Here’s the second one, a little further back in the hedge. Haven’t seen them since, although I’ve been looking. 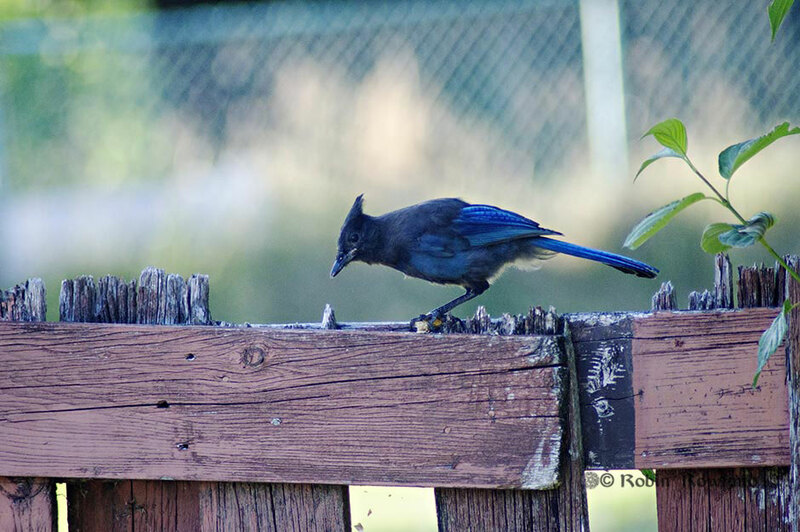 I believe their parents are still around my yard, as a small resident family of stellar jays has been for years. So hopefully they’re either back with family or, since that hedge was close to the bush, they’ve found a new home in the forest. 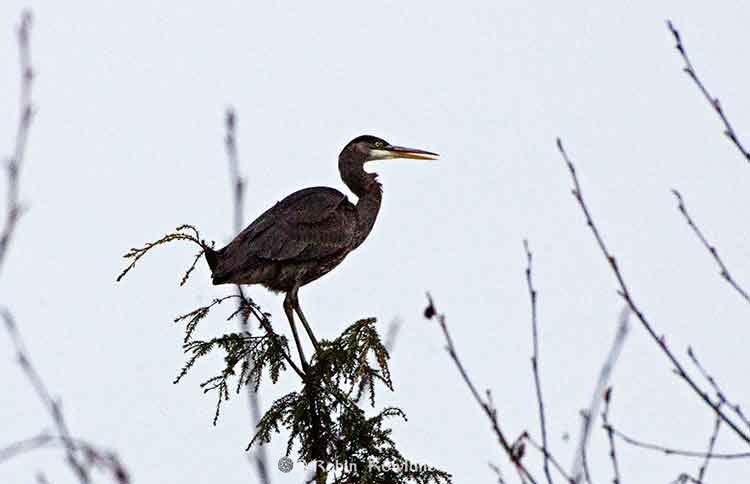 A Great Blue Heron perches on a tree overlooking the Kitimat River during the Christmas Bird Count, December 15, 2012. The bird count photo op wasn’t as good this year as it was last year. It was just as overcast with low late December light, but this time it was high tide with wind gusts making for chop on the ocean, estuary and river and that meant not as many birds in view. 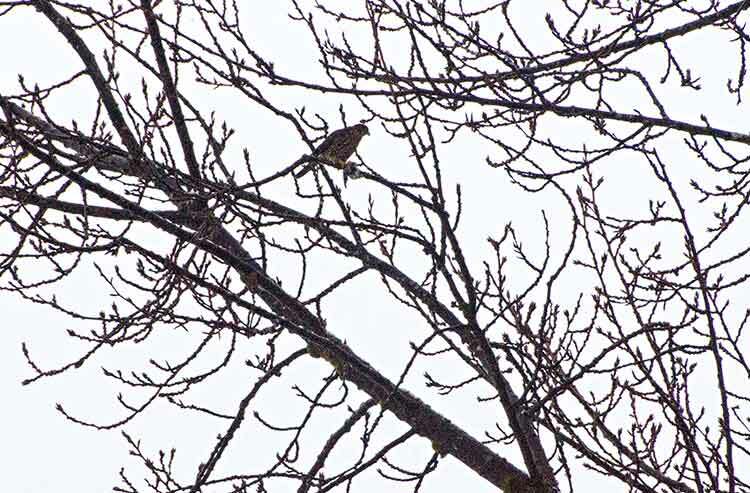 As we were starting out, we spotted a merlin, a falcon, (marco columbarius) on a bare branch overlooking the Kitimat River, devouring prey, a smaller bird. 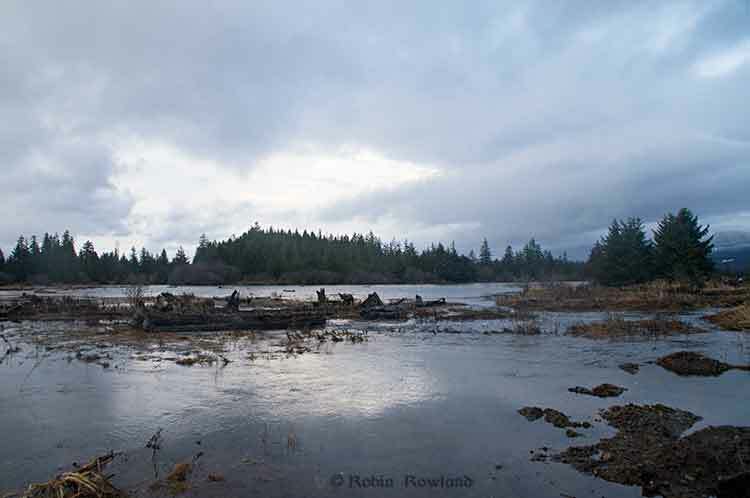 There wasn’t a bird to be seen at the Kitimat River estuary. 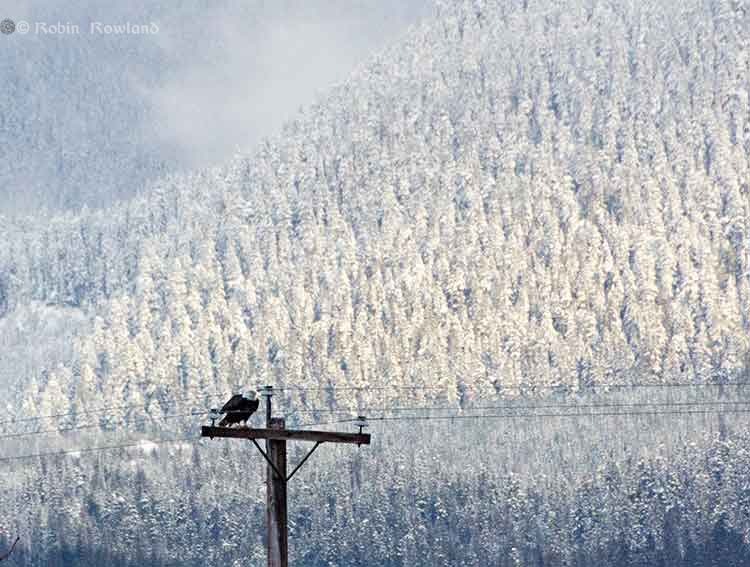 Although we could see a bald eagle on a telephone pole far off at the other end of the estuary. 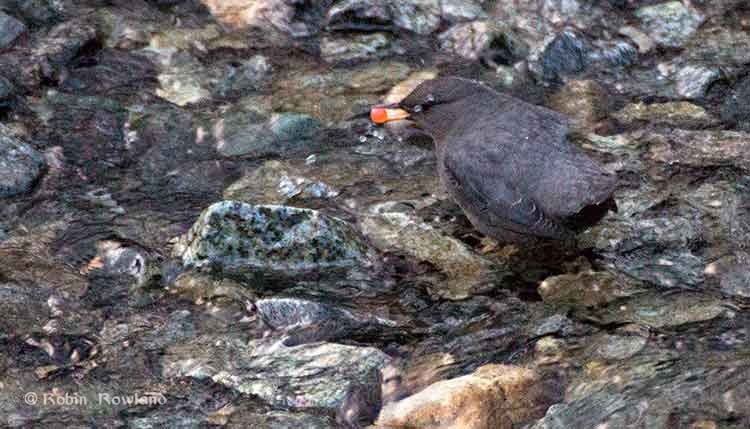 As we were finishing the tour of the estuary, we spotted an American dipper grabbing a salmon egg out a rocky creek. The American dipper (cinclus americanus) has a special ecological niche, a fast moving stream. 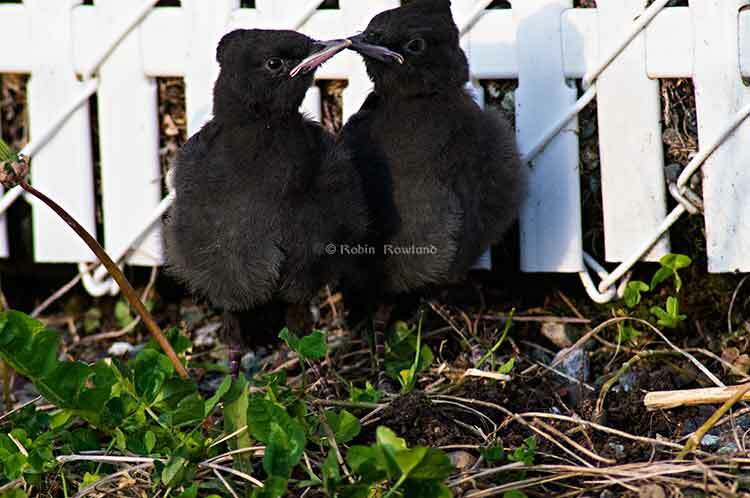 (The American dipper was also known as the “Water Ouzel”). 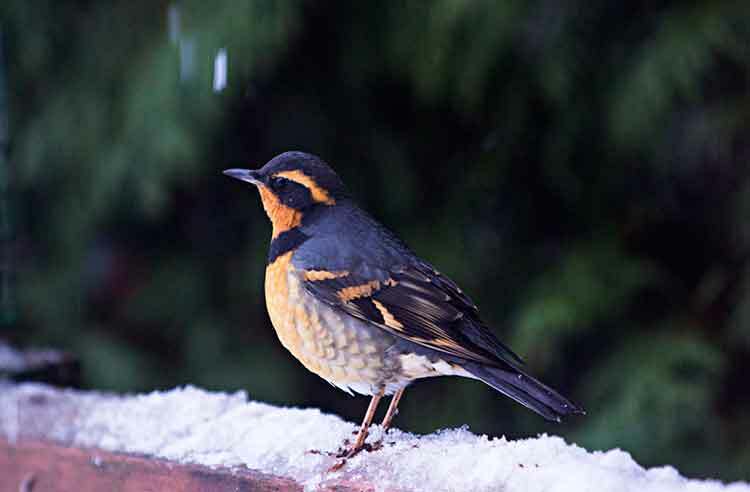 Although the estuary bird count wasn’t that successful, I did get some interesting visitors to my feeder. One of the at least three families of stellar jays that live in the cedar trees at my house is bolder and smarter than the rest. 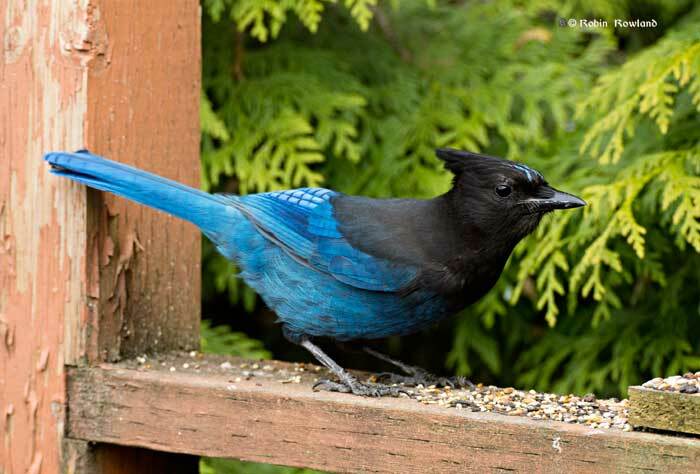 Or maybe it’s a “point bird.” If I go out with a bag of seeds to refill the feeder, there is the harsh call of the stellar jay and in a few moments, the bird is close by (often on my deck) and watching me pour the seeds into the feeder. 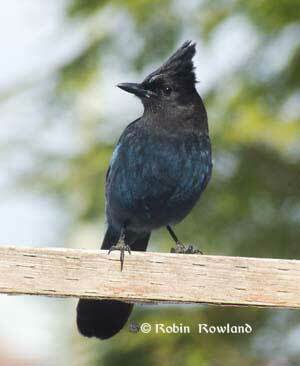 So a couple of days ago, the stellar jay was sitting on my fence, watching, as I filled one feeder. Went back in the house to get a different bag, for a second feeder. Brought my camera along this time and caught the jay as it took off, heading right for me. Bold or what? 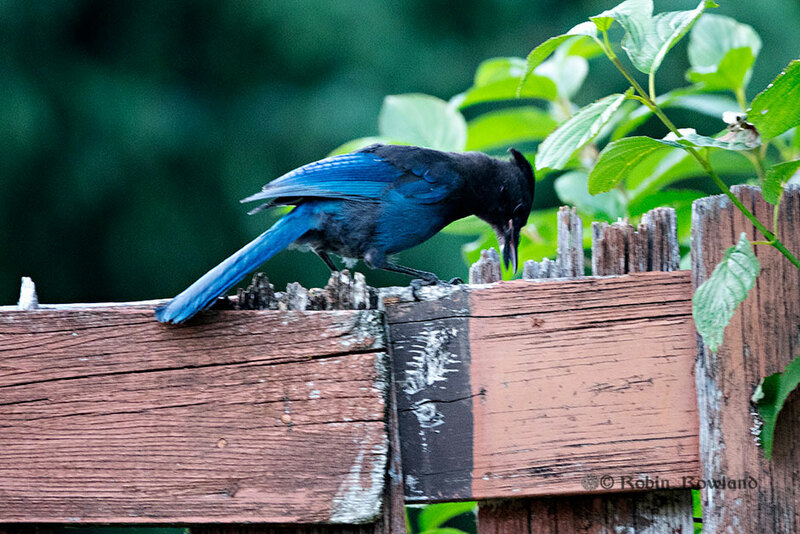 Here’s the stellar jay just a few seconds later on my deck. 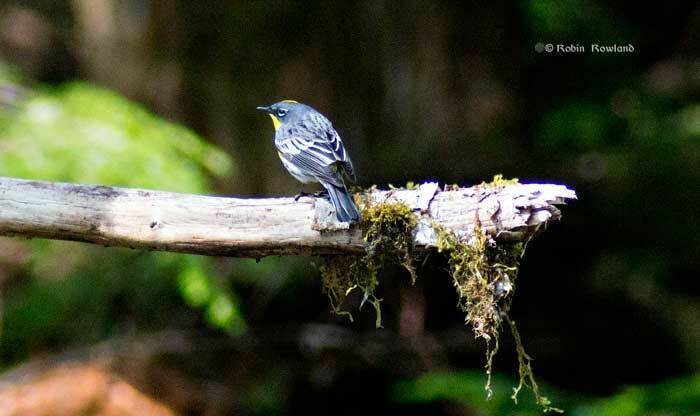 A yellow-rumped warbler, a “common migrant” along the BC coast, sits on a branch on the new trail to Maggie Point near Kitimat harbour. Mallards flying over the choppy ocean of Douglas Channel near Maggie Point. 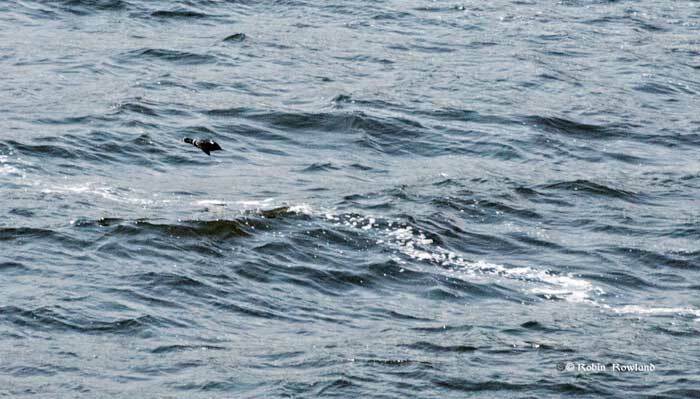 A male Harlequin duck skims the choppy waters. 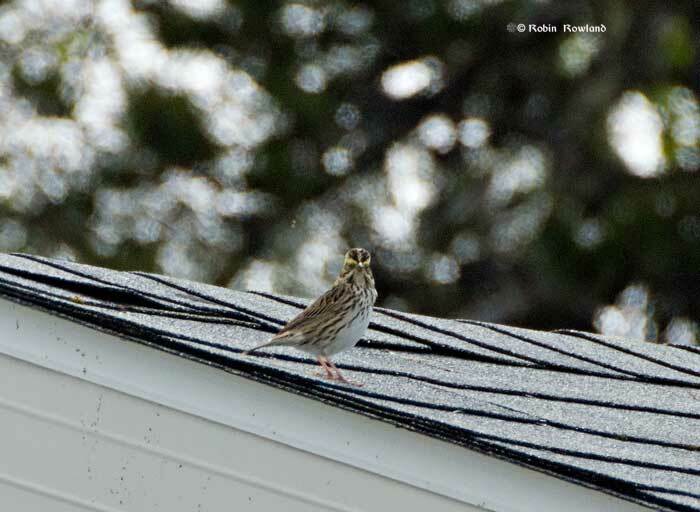 A Savannah Sparrow another “common migrant” along the BC coast, sits on my neighbor’s roof. 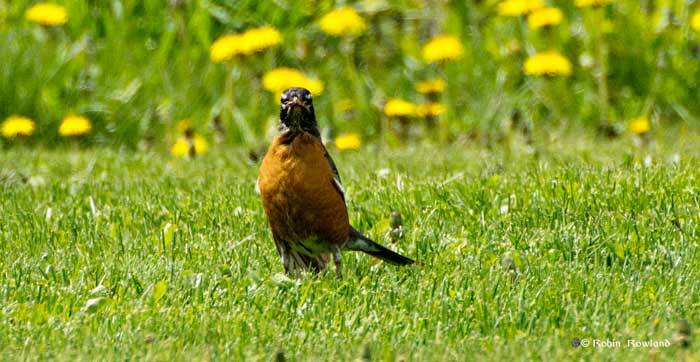 A robin checks out a Robin on my front lawn. 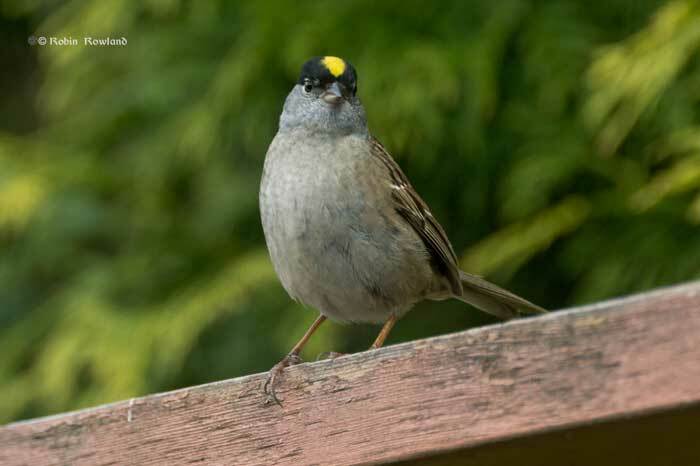 Golden-crowned sparrows are also regular lunch guests at my feeder. Not sure who this little guy is. 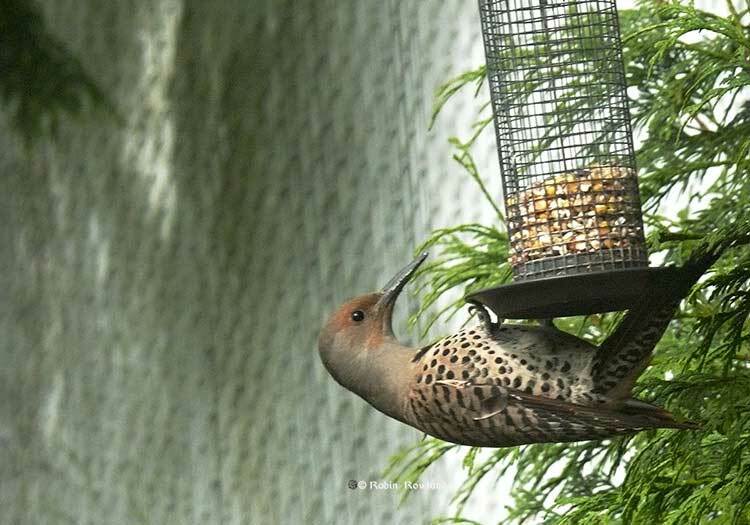 He was determined to get seeds and was good at finding the best spots in this feeder. 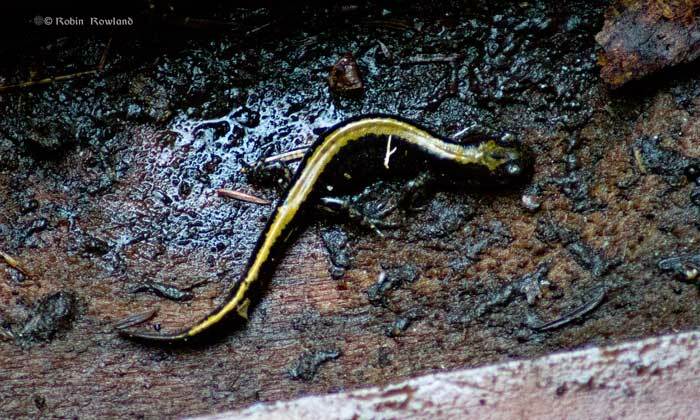 When I went out with the Kitimat Valley Naturalists, we went to special protected sites at Pine Creek, near Kitimat, to look for salamanders, part of a province-wide salamander count. Taken with a macro lens, but not exactly the best light. Next time I go out I will bring a small reflector. Rather crowded lunchtime at my feeder, July 31, 2011. 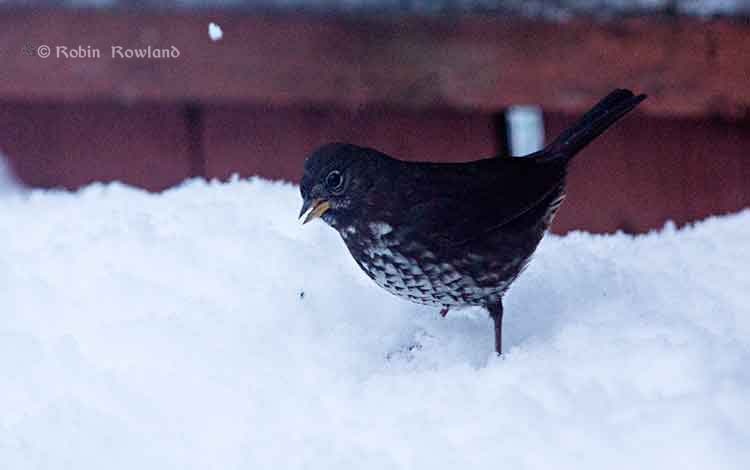 Spring is coming quickly to Kitimat, but with a near-record snowfall this winter, where more than two metres or six feet of snow filled my back deck, it was impossible to get to my feeders. With most of the snow gone from the deck (not all) I filled the feeder and put up the feed bag. 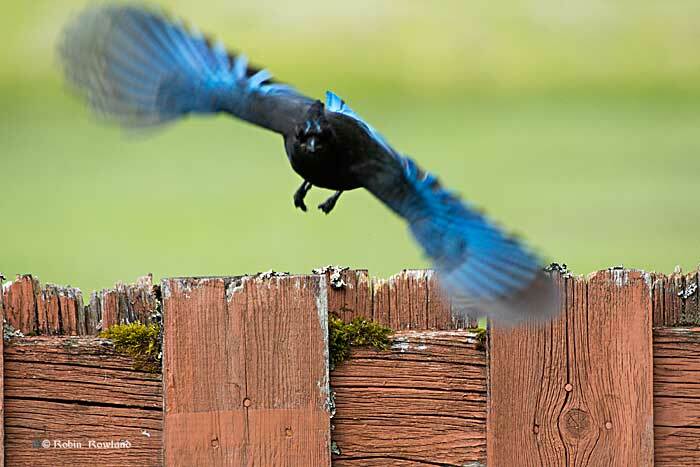 So the three pairs of stellar jays that live the cedar trees around my house came swooping down almost immediately. 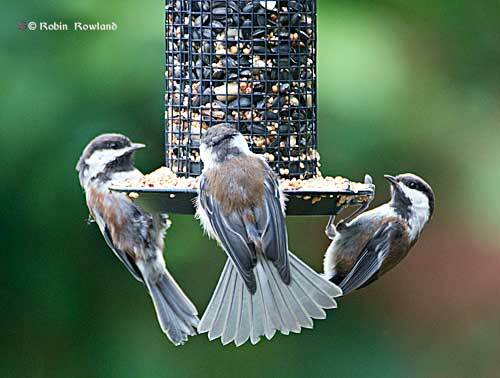 The feeder bag was quickly destroyed and the seed scattered all over the deck.